The new prison safety statistics sadly show worst ever figures, yet again. 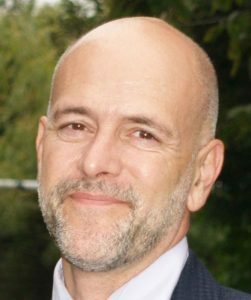 Yesterday (31 January 2019) the MoJ latest quarterly safety in Custody statistics bulletin showed that far from turning around, our prisons crisis continues to deepen. The bulletin covers deaths in prison custody for the year to December 2018 and assaults and self-harm for the year to September 2018. As you can see from the main points reproduced below, all the key indicators are at extremely worrying levels. Homicides and suicides in prison both show increases on the previous year. Incidents of self-harm, assaults on staff and on prisoners all reached their highest ever levels, yet again. In 2018, there were 325 deaths in prison custody, an increase of 10% from 295 in the previous year, at a rate of 3.9 deaths per 1,000 prisoners. The most recent quarter saw the number of deaths rise to 82, an increase of 5 from the previous quarter. There were 92 apparent self-inflicted deaths, up 31% from 70 in the previous year. 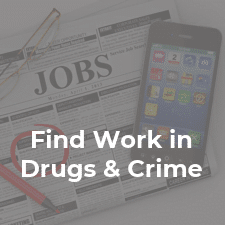 On a rate basis this is 1.1 per 1,000 prisoners in 2018. Within the female estate, there were 3 self-inflicted deaths at a rate of 0.8 per 1,000 prisoners during this period, compared to 2 self-inflicted deaths in the previous year. There were 4 apparent homicides, up from 3 incidents in the previous year. In the 12 months to September 2018, there were 52,814 reported incidents of self-harm (a rate of 629 per 1,000 prisoners), up 23% from the previous year. The number of self-harm incidents requiring hospital attendance increased by 4% to 3,179. The proportion of incidents that required hospital attendance decreased by 1.1 percentage point to 6.0%. On a quarterly basis, the number of incidents in the three months to September 2018 increased to 15,316 (up 12% from the previous quarter), 859 (6%) of which required hospital attendance (up 3% from the previous quarter). The number of prisoners who self-harmed in the 12 months to September 2018 was 12,467 (a rate of 148 prisoners per 1,000), up 10% from the previous year, and the highest figure in the time series. Those that self-harmed did so, on average, 4.2 times, although a small number of prolific self-harmers have a disproportionate impact on this figure. In the 12 months to September 2018, there were 33,803 assaults incidents (a rate of 403 per 1,000 prisoners), up 20% from the previous year, and a new record high. In the latest quarter, there were 9,082 assaults, up 5% from the three months to June 2018. 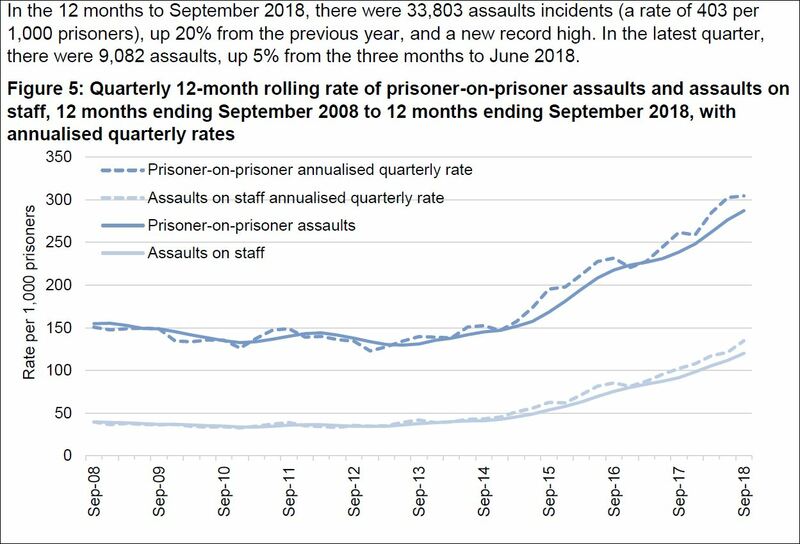 There were 24,138 prisoner-on-prisoner assaults in the 12 months to September 2018 (a rate of 287 per 1,000 prisoners), up 18% from the previous year, and a new record high. The latest quarter saw 6,373 incidents, an increase of 1% from the previous quarter. There were 10,085 assaults on staff in the 12 months to September 2018 (a rate of 120 per 1,000 prisoners), up 29% from the previous year. This is the highest level in the time series. In the latest quarter, assaults on staff increased by 12% to a new record high of 2,820 incidents. There was a change in how assaults on staff have been recorded since April 2017 which simplified how incidents involving staff are identified, however it is possible this has increased the recording of incidents. I am deeply dismayed at having to put myself and readers through the upset of looking closely at these statistics four times per year. Safety in Custody Bulletins should not be particularly newsworthy. However, because the data are so recent (up to last December for deaths and September 2018 for self-harm and assaults), I do believe they are the most reliable indicator of the state of our prison system. 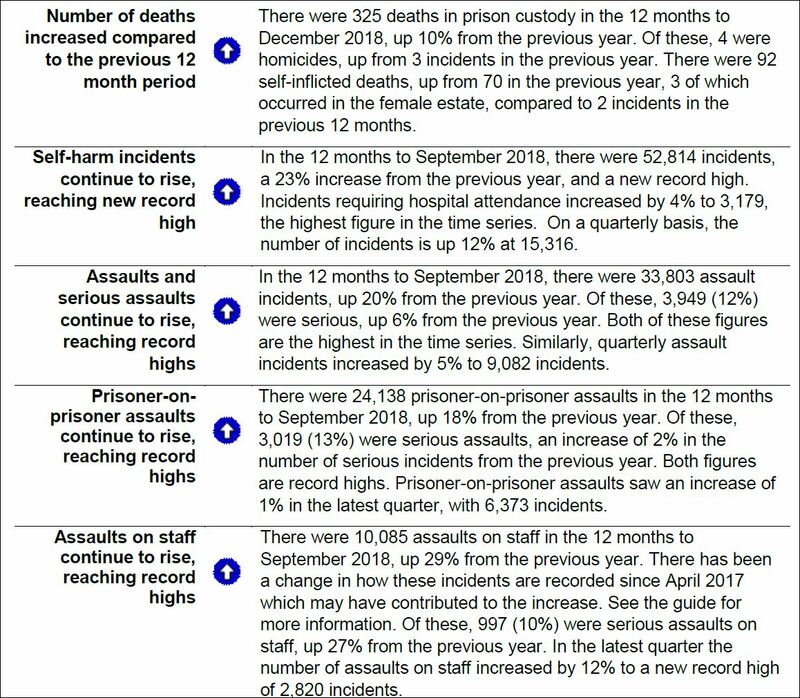 The fact that this quarter’s statistics once again include the highest ever number of incidents of self-harm, assaults on prisoners and assaults on staff is profoundly dispiriting. Every day in prison, life becomes more violent for both prisoners and prison staff. The number of assaults have doubled in the ten years from 2008 to 2018. We must all hope that Rory Stewart’s 10 Prisons project bears fruit and rates start to fall as soon as possible.